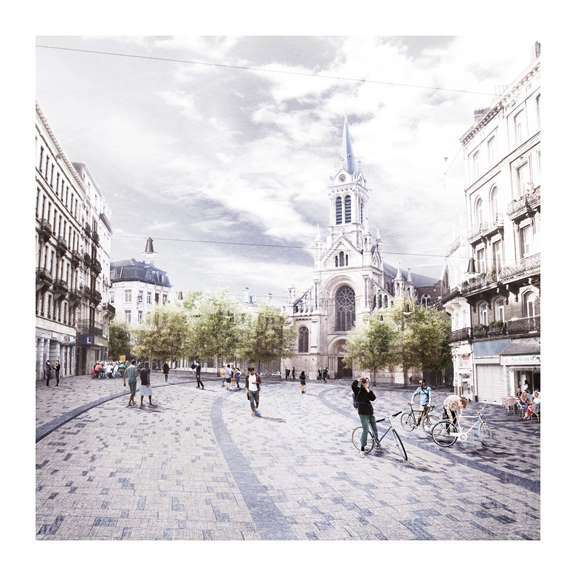 In June 2013, the Mayor of the Municipality of Saint-Gilles and its Urban Planning department decided to transform the so-called The Saint-Gilles Esplanade into a pedestrian area. Parallel to this political decision it has been voted a call for projects in order to renew and reclaim the potential public space area, which was potentially there but needed to be transformed. The local public authorities went through a long process of selection to finally decide in Spring 2014 to select the project of the Brussels-based landscape architecture Bureau Bas Smets. From 4 to 7 September 2014 from 10 am until 6 pm, the inhabitants and citizens of the municipality were invited to discover the final project of the future The Saint-Gilles Esplanade by following the full process of conception, transforming the existing multifaceted land into a homogeneous and liveable urban landscape, mixing the functions of the church, the cafés and restaurants as well as the marketplace. The sketches, which were presented to the population have started to be discussed by the people involved in the neighbourhood, at a local and regional level, in order to respond as best as possible to the new expected usages. This ongoing process has entered in May 2015 in its second phase knowing that there is still an issue related to the replanting of the trees on the esplanade that Bas Smets suggests to move to another square down to the esplanade as well as around the church that is at the top of the hill. This coherent approach is much motivated by the state of the trees which need to be replaced for some of them in order to re-create an urban land-scape on the piazza but also on the public squares at the top of and down the hill. The municipality of Saint-Gilles including the Mayor of Saint-Gilles and his City Planner, the Brussels Capital Region, the municipality’s inhabitants, the shopkeepers, the owners of cafés and restaurants, the church. The users are involved at all levels of this project, which is targeting new usages to be developed to respond to inhabitants’ needs in the neighbourhood. Some additional functions have been added to the public space: a moveable urban lighting system in order to ease the organization of temporary events and festivals on the long free-walk square. The re-use of the blue stone coming from the existing pavement on the square has allowed Bureau Bas Smets to design the lines to delimit the functions in the urban space, which adds on a contemporary and singular identity to the new piazza and ease the re-organisation of the cafés, restaurants and marketplace on the redesigned esplanade.